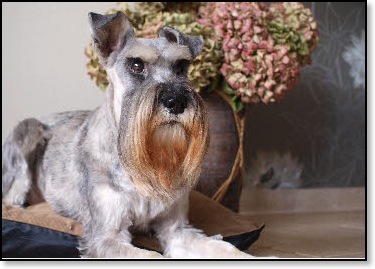 After her adolescence years behind her she was everybody's friend, not really a schnauzer but feature everybody liked and everyone was really was sold when they met her. Small children found it fun and most of her dogs for a round of racing have challenged her heels often to admire. Saatje had her own basket, so she did not have to share with others. Two years ago she got a hernia and regularly dropped by her hind legs, but with rest and a daily pill, GlucoMotiion, things went well. Not too long hikes, but in November when we went to the Ardennes, she ran really well with her hind legs. The snowfall this winter, was a party for her, because she, unlike her Miniature Schnauzers, fond of! When we went out a whole group of Schnauzers (on on January 17 ) to the Hook of Holland, it was already clear that something was wrong, she drank a lot of water and was literally lost. Research showed that she had a tumor on her pituitary and it grew too fast, too fast for the medication to work. Her time was up. Say hello to all those dear friends of yours that you have gone.